The Avocado is considered to be a very healthy food, because it provides your organism with the healthiest nutrients. You may not know this but the avocado seed is even more packed with nutrients than the flesh or the skin. The avocado also has the most soluble fibers in the world. Therefore one avocado seed contains the entire daily dose of fiber that our body needs. The avocado seed contains more antioxidants than the avocado itself. Also it contains more antioxidants than many other fruits and vegetables. But that’s not all! – Here is one astonishing fact – the flesh and the skin of the avocado contain only 30% of the antioxidants. The other 70% are found in the seed. The antioxidants have very beneficial properties. They are the ones that prevent heart diseases, lower the cholesterol and prevent different sorts of illnesses. – The avocado seed can help you reduce inflammatory diseases in your body and also can ease swelling in the gastrointestinal tract. – Because it is rich in fibers, the avocado seed can even prevent or relieve constipation and help ease diarrhea. – The antioxidant, known as phenolic compound, is found in the seed and it is known to help alleviate pain from gastric ulcers due to the anti-viral and antibacterial properties. – The avocado seed also contains another very important antioxidant. This antioxidant is called flavonol and it can help you fight cancer. People who have cancer need to consume foods rich in flavonol, and because of that the avocado seed is perfect for them. –If you have a weak immune system and suffer from frequent colds during the flu season, you need to include the avocado seeds in your diet. These seeds will help you strengthen your immune system. – We can say that the reason why people suffer from cancer, get sick and age a bit faster, are the free radicals. If you want to prevent all of that, the avocado seed can help you fight the free radicals. The avocado seed has the ability to rebuild the collagen underneath the skin. Therefore if you want to have a youthful look, you need to consume avocado seeds. – However this is not all! The avocado seed can help you feel energetic by reducing body aches, joint discomforts and bone diseases; it can help you lose weight and lower blood glucose levels. Also it can help with exercise-induced asthma and it can even make you feel fuller by reducing food cravings. 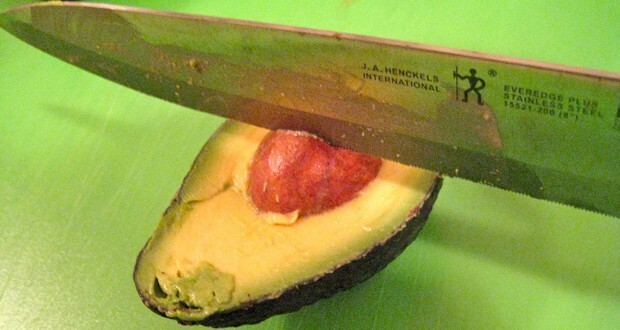 First of all you need to take a knife and slice open the avocado vertically from both sides. It should open easily if it is ripe. Then take out the seed. Now, you can do two things with it. The first thing that you can do is to put the seed in a plastic bag and smash it with a hammer. Then you need to put it in a blender with some other ingredients such as banana, spinach or other dark green vegetable, in order to make a smoothie. If you have a more powerful blender you can put the seed in with the rest of the ingredients without crushing it. Finally the most important thing is to add some water. Mix it all together in your blender. Your avocado seed smoothie is ready. Drink it and enjoy a healthier life.